ABSTRACT: Ancient Rome is famous for its water and wastewater systems. This paper is a discussion of the impact these systems had on living conditions in the imperial city. Rome's water system provided a constant supply to centrally located areas, in contrast to modern systems which deliver water on demand to individual connections. For both water and wastewater systems, access points were generally outside the household. Because of this lack of individual connections, Romans were forced to spend much of their time outside their tenements in the shops, streets, latrines, baths, and arenas of the noisy, vibrant city. ����(1) How was water used in the imperial city? ����(2) Who benefitted from Rome's water supply? ����(3) What impact did the water and wastewater systems have on public sanitation and fire protection? ����(4) What operation and maintenance problems did the systems have? ����(5) How do Rome's systems contrast with contemporary water and wastewater systems? A variety of first-hand written material concerning public utilities and general life in ancient Rome is available. This information has been augmented with considerable archeological evidence. This paper combines information from both to construct a picture of life in imperial Rome. Rome's authors frequently wrote from diverse points of view. This has resulted in contradictory images of the imperial city. In general, written records have given us two distinct descriptions: the first is the classical city of grandiose monuments and engineering marvels; the second is the Rome described by the ancient satirists. Representing the classical image of Rome is Sextus Julius Frontinus, the water commissioner at the end of the first century A.D. The books of Frontinus have made him the most famous of the Roman engineers. He has left us his personal account of the water system of Rome: De aquae ductu Urbis Romae. He described in proud detail the sources, length, and function of each of Rome's aqueducts. Frontinus is best remembered for his statement (Frontinus, trans. by Bennett , 1961, p. 357): ". . . with such an array of indispensable structures carrying so many waters, compare if you will, the idle Pyramids or the useless, though famous works of the Greek." This quotation tells us a lot about Frontinus; he was a utilitarian public servant with little interest in beauty apart from function. Representing the ancient satirists is Decimus Julius Juvenal, a contemporary of Frontinus. Very little is known about Juvenal, but he did leave the world sixteen poems. Nineteen centuries of readers have characterized his work with such adjectives as bitter, hysterical, profound, brilliant and pornographic. Juvenal satirized morals and life styles. He heaped considerable abuse on the living conditions in the imperial city. And what rest is there in the rooms we keep? The rich may rest my friend. It's their real power. And shoulder-high he's borne on four slaves. Walking Rome's street was frequently dangerous, for it was not unusual to dispose of trash by throwing it out windows. In Pompeii there are many well preserved examples of the traditional single-family house, the domus, with its characteristic arrangement of rooms around a central atrium. In densely populated Ostia, on the other hand, as in Rome itself, only the very wealthy could afford a domus; the middle and lower classes lived in three-to-six story apartment buildings call insulae. The ground floor of the insulae frequently housed commercial shops. Most of Rome's dwellings were ill-supplied with heat, light, and water. The sanitary arrangements, if judged by modern standards, were inadequate. The typical Roman must have lived almost entirely outside of his tenement house, in the streets, shops, latrines, baths, and arenas of the city. The domicile must have served principally as a place to sleep and store possessions. Romans, at first, turned to the Tiber River, local springs, and shallow wells for their drinking water; but water obtained from these sources grew polluted and became inadequate for the city's growing population. It was this necessity that lead to the development of aqueduct technology. The date of the first aqueduct is assigned to the year 312 B.C. During the time of Frontinus, nine aqueducts conveyed water from distant springs and streams to Rome (Table 1). The water in the aqueducts descended gently through concrete channels. Multi-tiered viaducts were used to cross low areas. Inverted siphons were employed (sparingly) when valleys were particularly deep. Tunnels, burrowed through hill too difficult to skirt, were equipped with vertical shafts for inspection and cleaning (Figure 2). Debris cleaned from the tunnels was dumped beside the openings to the vertical shafts. Modern archaeologists have been able to locate long abandoned conduits by finding the piles of debris (Smith, 1978). Table 1. Information Concerning the Nine Aqueducts in Existence at the Time of Frontinus. Source: Lanciani, 1967, p. 58. Various vestiges of aqueduct bridges are still in evidence in and around modern Rome. The popular but inaccurate image is that Roman aqueducts were elevated throughout their entire length on lines of arches. Roman engineers were very practical; whenever possible the aqueducts followed a steady downhill course at or below ground level. Inverted siphons, viaducts, and tunnel were used sparingly, when difficult conditions could not be met by any other techniques. 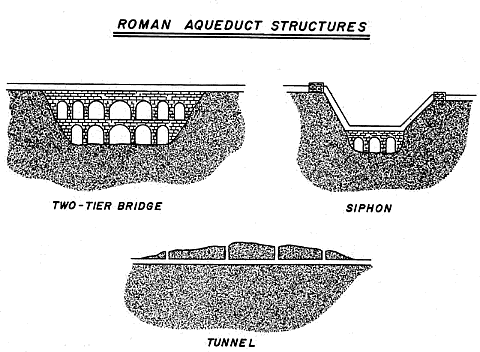 The system of aqueducts serving Rome had only 5 percent of its total distance supported by viaducts or bridges (Smith, 1978). In the long run, the elevated sections were not an unqualified success. Both archeological and written evidence indicate they required extensive and frequent repairs, which entailed lengthy interruptions in the flow of water. According to Smith (1978), the Aqua Claudia, which was under construction for 15 years, was repaired after 10 years of use and 9 years of disuse, repaired again 9 years later and worked on once more just four years later. Evidence of substandard construction and repair work is evident in the sections of the aqueduct that still exist.
. . . a large number of landed proprietors, past whose fields the aqueducts run, tap the conduits; whence it comes that the public water courses are actually brought to a standstill by private citizens, just to water their gardens. Providing Rome an adequate water supply required a constant vigil on the part of water officials. The aqueduct channels were equipped with air vents or inspection holes. The channels were usually rectangular in the cross-section and varied from 0.5 to 2.0 meters in width and from 1.5 to 2.5 meters in depth. Sometimes two or three channels were superimposed, the upper ones being added to the original to accommodate increasing demand. Once in or near Rome, water from the aqueducts passed into large, covered catch-basins. Here waters were supposed to deposit their sediment (Frontinus, 1961, p. 361). Waters from the catch-basins were distributed through free-flowing canals, lead pipes, and terra-cotta pipes to storage reservoirs and then through lead pipes (called fistulae) to users. The number of connections to private customers were limited; most Romans were obliged to get their supply of domestic water from public fountains.
. . . There are extensive areas in various places where secret pipes run under the pavement all over the city. I discovered that these pipes were furnishing water by special branches to all those engaged in business in those localities through which the pipes ran, being bored for the purpose here and there by the so-called "punctures". How large an amount of water has been stolen in his manner, I estimate by means of the fact that a considerable quantity of lead has been brought in by the removal of that kind of branch pipe. In the late nineteenth century, archaeologists found a lead pipe which conveyed water from a reservoir to the Roman Forum. The pipe was 1750 meters long and required 232,750 kilograms of lead (Lanciani, 1897). When it is considered that there were thousands of these conduits in Rome, one can get a feeling for Rome's massive dependence on lead. Figure 2. The Courses of the Nine Aqueducts in Existence at the Time of Frontinus (Source: Smith, 1978). As one might expect, Roman water quality standards were remedial, taking into consideration only such factors as taste, temperature, smell, and appearance. Since the quality of water from the nine aqueducts varied, the worst waters were used for articial lakes and irrigation, and the best for drinking. The aqueducts carrying water to Rome were covered to prevent the water from being contaminated by dust, dirt, and other impurities and from being heated by the sun. The best quality waters came from the valley of the Anio River. One source (Anio Novus) from that watershed, however, did have a water quality problem every time it rained. Roman engineers first tried mixing it with water from a nearby clear spring. Next they tried running it through a small settling basin. Because of design problems with the basin, this too was unsuccessful. Finally the condition of the water was improved by carrying the head of the aqueduct higher up the valley to a reservoir formed behind an immense dam near Subiaco. The articial lake served efficiently as a settling basin and the quality of the water was improved. The dam at Subiaco was built to form a pleasure lake for the Emperor Nero. It was a straight masonry dam and reached a maximum height of approximately 40 meters. The Subiaco Dam was the highest such structure built by the Romans and their only known use of dam technology in Italy. It failed in 1305 without leaving a trace (Smith, 1970). It has been hypothesized that Rome's dependence on lead water pipes lead to its decline. It has been suggested that the aristocracy died off from nothing more complicated than simple lead poisoning. Since almost all of the lead absorbed by the human body is deposited in bones, investigators have studied the bones of ancient Romans. While some studies did indicate above normal concentrations of lead, it seems unlikely that water pipes were a contributing factor. Hodge (1981) has correctly pointed out that lead pipes would not have caused contamination for two reasons: (1) because the Roman water contained high concentrations of calcium which formed deposits inside the pipes, insulating the lead and (2) because lead will never greatly affect running water. Figure 3. 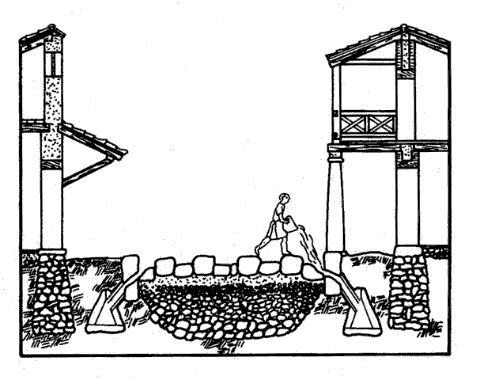 Illustration of the Structures Used by Roman Engineers on Their Aqueduct Systems. Multi-tier bridges were used to cross low areas. Inverted siphons were employed when valleys were particularly steep. Tunnels were equipped with vertical shafts for inspection and cleaning. Water was provided for a variety of uses including fountains (which served as sources for culinary water) and latrines, and for more exotic activities such as public baths and sham naval battles. With few exceptions, the water from the aqueducts reached only the ground floor of apartment buildings. The tenants of the upper floors had to rely on slaves to carry water or go themselves and draw water from the nearest fountain. Because fire was a constant concern, Romans were encouraged to keep water stored in their rooms. or poets spouting their dull, awful verses. Many must also have lived in a constant state of squalor. In fact, fire probably served an important public sanitation function. We know that Rome was struck by massive fires on several occasions. Most notable was the fire during the reign of the Emperor Nero which destroyed large sections of Rome because the city had no effective means of stopping the spread of the fire. Juvenal (1965, p. 43) indicated that arson was a problem, " . . . rumors hint that he set his house afire". Besides private connections and fountains, the aqueducts supplied water to latrines. Many of Rome's were sumptuous. All around the circular or rectangular structure, water flowed continuously in small channels. One of the more elaborate establishments had 20 seats made of marble and each seat was framed by sculptured brackets in the form of dolphins. Occasionally the latrine was cheered by the sounds and sights of a fountain. Latrines were heated; nothing is colder than marble. Two common forms of entertainment--baths and sham naval battles required large quantities of water. During the Roman Empire, baths became more and more elaborate, providing not only bathing facilities, but games, lectures, musical performances, prostitutes, calisthenics, and places to lounge and gossip. The baths had hot, warm, and cold water pools. The water in the pools was changed several times each day. The air and water were heated by a number of underground furnaces. These furnaces were like bakers' ovens. Water of two different temperatures--hot and warm--circulated automatically by thermo-siphon. Another popular form of entertainment was the sham naval battle on articial lakes (naumachia). These not-so-sham battles were the most elaborate of all spectacles offered at Roman celebrations. The contestants butchered one another until one side or the other was eliminated; the victors, if they fought bravely, were occasionally given their freedom. The Emperor Domitian had the arena of the Coliseum flooded and reproduced an historic naval battle. Special piping was installed under the floor for flooding. The arena, however, proved to be too small. Roman historians report that Domitian staged sham naval battles with almost regular fleets, having dug an artificial lake near the Tiber River and surrounded it with seats. His enthusiasm was so great he continued to watch contests amid heavy rains (Suetonius, trans. by Rolfe, 1951). Generally the aqueduct with poorest quality water was used to fill the naumachia. One unresolved historical problem regarding water use bears discussion; the quantity of water provided by the aqueducts. In general, data provided by archeological evidence and written accounts fall short of that required for the computation of either per capita supply or per capita use. The cross-sectional areas of the aqueducts are known, but one cannot be sure the conduits ever ran full. Sizing of the channels was probably determined as much by the need for work space as by the volume needed for water. As previously mentioned, it was certainly a rare occasion when the aqueducts were all working at the same time. Another uncertainty is the population of Imperial Rome. No accurate estimate exists for any particular period. It is generally assumed that during Frontinus' era the population of Rome was approximately one million (Parker, 1967). Early opinions on the amount of water delivered by the aqueducts varies from a low of 322,000 cubic meters per day (Herschel, 1913) to a high of 1,010,623 (Ashby, 1935). There is also little consensus among more recent estimates. Bruun in his 1991 monograph (p. 100) prefers a number in the 600,000 range; this number he feels is the most defensible, given the current level of knowledge. This latter figure computes to a per capita supply of 0.6 cubic meters (or 600 liters) per day. But this figure is misleading because of the unequal division between public consumption (44 percent according to Frontinus) and the small number of private users (who received a combined 38 percent). Bruun (1991, p. 103) makes an estimate of the per capita useage of the middle and lower classes. According to Frontinus, the aqueducts served 591 lacus (or major delivery points), and each, on average, delivered 60 cubic meters of water per day. Bruun estimates that each delivery point served, on average, 900 individuals. This computes to a per capita water use of 67 liters per day. This figure is considerably lower than all previous estimates, but it is not too low when you consider that Romans could also benefit from water from baths, latrines, and other establishments, as well as from rainwater and the Tiber River. The 67-liters-per-day figure is only water delivered from the lacus. It would seem that for the ordinary Roman, this quantity or water was satisfactory, but not lavish. Contemporary residential customers in the United States require approximately 250 liters per person per day. But comparing Roman water supply and useage rates with contemporary needs is problematic. It is commonly felt that water to ancient Rome was delivered in a constant flow instead of on-demand (as with modern systems). For example, water flowed through a latrine in one continual stream, not just when flushed as is the case with the modern toilet. Fountains ran night and day. For this reason, to compare a per capita water use figure for Rome with a twentieth-century figure is somewhat misleading. Arguably the Romans considered water flowing day and night as a particular sign of richness and a high standard of living. But this does not necessarily mean that they paid little attention to the storage of water, or to regularizing the water flow. In fact there exists sundry evidence that measures for saving water had been adopted. It is often maintained that the Romans did not make use of taps and similar devices in this distribution net; e.g. Frontinus never even once refers to such objects. But as a matter of fact archeological discoveries have brought forward a large amount of evidence for their use. It is safe to assume that Rome received in impressive supply of water, and that the rich and influential received a disproportionate amount. But the water supply for the common Roman was still sufficient. By historic standards, Roman's water supply was a very impressive accomplishment. Water from the baths, latrines, palaces, fountains, etc., as well as other urban runoff was discharged into Rome's drainage and wastewater collection system. Several centuries before the birth of Christ, Etruscan engineers built the initial drainage system (Cloaca Maxima) whose main outlet into the Tiber River still exists 28 centuries later. The covered drains were designed on such a large scale that in certain sections wagons loaded with hay could drive through with ease. Rome's sewers and drains emptied directly into the Tiber, whose polluted state must have been a constant problem for the Roman populace. The Roman sewers have been overpraised. Despite their longevity, they ignored basic sanitary principles. They carried sewage, urban runoff, and drainage water together. This multiple employment made it necessary to have large openings along the streets. These openings exposed Rome's populace to the effluvia of the sewers. To mitigate this danger to public health, Romans had only two protections: (1) the masses of water from infiltration and the aqueducts which constantly flushed the drains, and (2) the hilly nature of the city which gave the drains a steep slope. The Roman sewer system probably carried off at least as much water as the aqueducts provided. Consumptive use in Rome was not high and there was a lot of infiltration into the drains from groundwater (parts of Rome are constructed over swamps). The flow of the Tiber River was greatly increased by discharges from Rome's sewers. Although the ancient sewers were very skillfully constructed, they were not used to their full potential. There were few private connections to the sewers. Even with the wastewater system's shortcoming, it is astonishing to note the absence of significant improvements in collection systems until the 1840's, some 17 centuries later. striking the head, and injuries grow rank. There's death from every window where you move. You can but hope they spill a chamberpot. Fouled or even injured, the passer-by had no recourse except to file a complaint. Many passages written by Roman legal authorities indicate that the problem of falling debris was not trivial. Ulpian, a fourth century jurist, even classified the various clues by which it was possible for an injured party to find a culprit. When in consequence of the fall of one of these projectiles from a house, the body of a free man shall have suffered injury, the judge shall award to the victim in addition to medical fees and other expenses incurred in his treatment and necessary to his recovery, the total of the wages of which he has been or shall in the future be deprived by the inability to work which has ensued. It would appear that the lack of pumping in Rome may have inspired contemporary laws related to accidents and liability. The instructions of Ulpian give us a glimpse of the conditions which must have existed in ancient Rome for such a legal analysis to be necessary. Clearly public sanitation must have been a very real problem. Many back streets must have reeked of urine and worse. Figure 4. 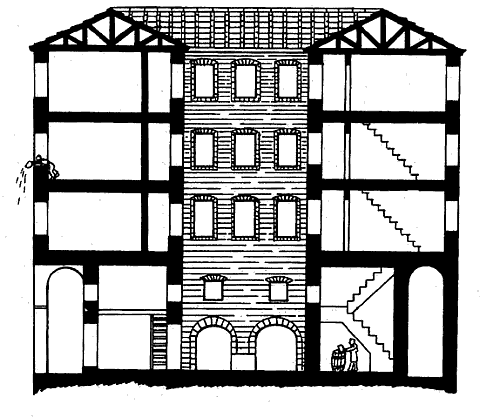 Waste was Frequently Emptied Into Street-Side Openings to the Roman Sewers. The sewers carried off sewage, urban runoff, and drainage water together (based on Macaulay). Imperial Rome was a city not unlike many contemporary cities. It was filled with apartment buildings and noisy streets, and its services were often less than satisfactory (if judged by modern standards). Notwithstanding its problems, Rome's water system was a superb engineering achievement. Frontinus had a right to be proud. Imperial Rome was supplied with large quantities of high quality water. Once the water arrived in Rome, however, the distribution system was quite limited. With both the water and wastewater system, access points were generally located outside the household. But it must be remembered that Rome's water and wastewater systems were the best in antiquity and that improvements in their designs were not made until the modern era. Rome's system of providing a constant water supply to centrally located areas contrasts markedly with modern systems which deliver water on demand to individual customers. Certainly modern systems provide the flexibility necessary for improved fire protection and public sanitation. Today's systems are certainly more convenient that were their Roman counterparts. Modern American life is to a great extent centered around the household. This was not the case in ancient Rome. For example, there was obviously no television coverage of the gladiator fights at the Coliseum. Romans lived to a large extent outside their abodes. Thus, not having running water and sanitary facilities nearby was not the inconvenience it is today. Graphics for this paper were provided by Floyd Barnes. The author owes a major debt to David Macaulay for the illustrations. Ashby, Th., 1935. The Aqueducts of Ancient Rome (ed. I. Richmond), Oxford. Bruun, Christer, 1991. The Water Supply of Ancient Rome: A Study of Roman Imperial Administration. The Finnish Society of Sciences and Letters, Helinki. Carcopino, Jerome, 1947 (first published in 1940). Daily Life in Ancient Rome. Yale University Press, New Haven, Connecticut. Frontinus, Sextus Julius (trans. Charles Bennett), 1961. 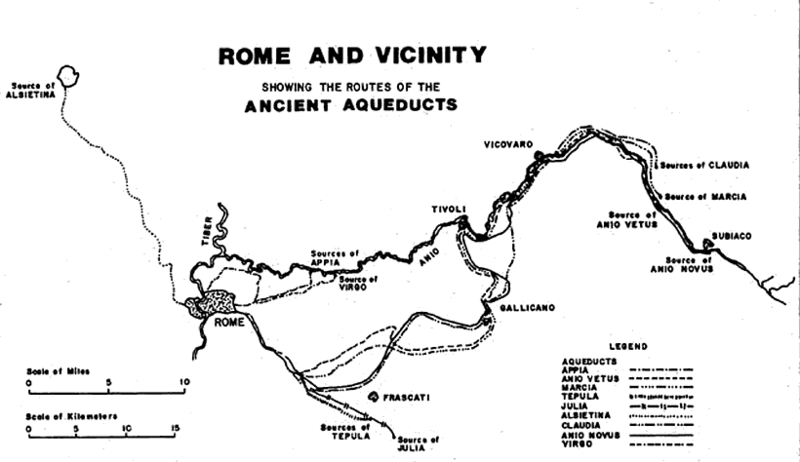 Stratagems and the Aqueducts of Rome. Harvard University Press, Cambridge, Massachusetts. Hansen, Roger D., 1983. Water and Waste Water in Imperial Rome. Water Resources Bulletin. 19:263-269. Herschel, Clemens, 1913. Frontinus and the Water Supply of Rome. Longman, Green and Company, New York. Hodge, A.T., 1981. Vitruvius, Lead Pipes and Lead Poisoning, AJA 85: 486-491. Juvenal, Decimus Julius (trans. Jerome Mazzaro), 1965. Satire. University of Michigan Press, Ann Arbor. Lanciani, Rodolfo, 1967 (first published in 1897). The Ruins of Ancient Rome. Benjamin Blom, New York. Macaulay, David, 1978. City: A Story of Roman Planning and Construction. Houghton Mifflin Company, Boston, Massachusetts. Parker, James E., 1967. Housing and Population in Imperial Ostia and Rome. Journal of Roman Studies 57:82-91. Smith, Norman, 1970. The Roman Dams of Subiaco. Technology and Culture 11:58-68. Smith, Norman, 1978. Roman Hydraulic Technology. Scientific American 238:154-161. Suetonius Transquillus, Gaius (trans. J.C. Rolfe), 1951. Lives of the Twelve Ceasars. Vol. II, Harvard University Press, Cambridge, Massachusetts. Watts, Donald J. and Carol Martin Watts, 1986. A Roman Apartment Complex. Scientific American 255:132-139.